Once you reach the Haines Wayside Park, you are guaranteed to enjoy a great time with your companions. The park is great for family outings and group visits as it offers many features and attractions. This charming public park is visited by people throughout a year but especially for summer camp and picnic purposes, the spot gets crowded. 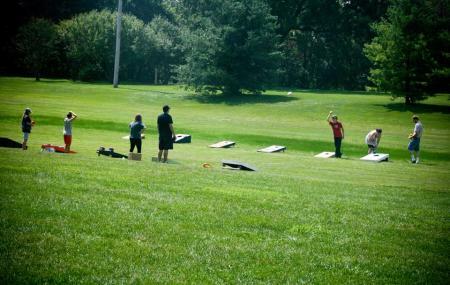 The key features of the Haines Wayside Park are disc golf facility, volleyball court, creative play area and ice skating zone. The park also features Drinking fountain, Playground equipment, Sand volleyball court and neat Restroom. How popular is Haines Wayside Park? People normally club together Freedom Park and Missio Dei Church while planning their visit to Haines Wayside Park. As far as disk golf. Not for the faint of heart. Not for the novice. While I consider myself as a beginner A step above a novice. Several the whole relatively easy while many of them have water obstacles and poison ivy. And if it has rained lately, this is not the court to go to. Some of the holes are in Deep Woods and really no throwing Lanes you just got a hope that you can get through. Not saying it's a bad place just not my favorite. Nice little park and frisbee park.. it's nice just to walk around.. they have a little area with tables that you can sit and eat. The park is in between house's. Fun place to go in the summer. The only thing I don’t like is mosquitoes sometimes come here too.